Summary: A bright June day. A split-second distraction. A family forever changed. 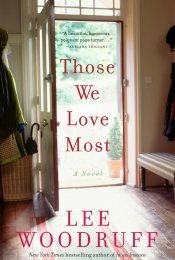 One book that I've dying to read ever since Adriana Trigiani (not only one of my favorite authors but also one of my favorite people) told me that I "had" to read it is THOSE WE LOVE MOST by Lee Woodruff. I've been Twitter friends with Ms. Woodruff for some time now -- she is so sweet; and, of course, I'm familiar with the heartwarming story of her husband Bob Woodruff. Ms. Woodruff is already a successful author of two nonfiction books IN AN INSTANT and PERFECTLY IMPERFECT; however, it's the release of Ms. Woodruff's debut novel that had me excited... especially after reading the fabulous blurbs from such amazing authors as Harlen Coben, Catherine Coulter, and none other than Adriana! I had an advance copy of THOSE WE LOVE MOST for some time now, but I was waiting for the perfect time to read it. Needless to say, this novel went into my book bag for our family vacation at the beach; and I have to say that it was a wonderful read. I'm not so sure that my family would agree because I basically ignored them for the hours it took for me to devour THOSE WE LOVE MOST. I adored this novel and I have been recommending it to everyone who will listen! At its simplest, THOSE WE LOVE MOST tells the story of a family who faces some tragedies and how the various family members subsequently dealt with them. It delves into marriage problems, infidelity, substance abuse, family dynamics, guilt, and ultimately forgiveness. On the surface, it might not sound all that original, but trust me, the characters in this book and their relationships are extremely complex -- and for that reason (and a few more that I'll mention later), this book is very, very good. The story begins when Maura, a mother of three, is walking her oldest son to school one morning. When she is distracted for just a second or two, her son rushes ahead of her on his bike and is hit by a teenage driver. It is an accident in the truest sense of the word, but Maura still blames herself and her guilt drives an even bigger wedge into already fragile marriage. Meanwhile, Maura's parents Margaret and Roger have their own set of problems. Margaret is a devoted wife, mother and grandmother, while Roger is a successful business man who isn't quite ready to retire. As far as appearances go, they seemingly have it all; however, Margaret is aware that her husband has been keeping secrets from her -- including his long-time affair with a woman in Florida. When Roger faces his own tragedy, Margaret has to make some crucial decisions about what role she wants to take in his life. I don't want to give too much away about the story, but I do want to warn you that these tragedies are a mother's and wife's worst nightmare, and parts of this novel won't be easy to read -- mainly because they are so real. As a mother, I think THOSE WE LOVE MOST affected me so much because I could relate in so many ways to the character of Maura -- her reactions to the accident, both her grief and her guilt, were so darn real. It was gut-wrenching to realize just how quickly everything can go wrong and how fragile our children's lives are; and I thought Ms. Woodruff did a fantastic job of delving into the aftermath of losing a child and the overall effects it can have on a family and a marriage. However, it was Margaret's story that really made this book extra-special to me. Margaret was a woman in her 60s who married young and spent her entire life being a loving mother and wife. She had pretty much sacrificed a career for her family; and even though it was her choice, she was left in a bit of a predicament when she realized that her husband was in love with another woman. I found Margaret's character to be extremely real and emotionally complex; and this might sound a little strange, but I was able to relate to her as much, if not more, than Maura. I loved how Margaret's character evolved throughout the novel, and I was extremely satisfied with how her relationship with Roger played out. Another part of this novel that I thought was outstanding was how it explored the concepts of grief and guilt. The story is told through the eyes of four different characters and I thought Ms. Woodruff did an excellent job of showing the various ways that people cope with tragedies. If I'm being entirely honest, I was a tad bit worried that this novel would be trite and the characters would fall flat; however, Ms. Woodruff made all of these individuals so genuine and believable. I think every reader will be able to relate to at least one of them, and that's one of the reasons I think this book meant so much to me. It was evident that Ms. Woodruff is no stranger to dealing with heartache and tragedy, and I think her experiences, as well as her compassion, is what made THOSE WE LOVE MOST so good. It probably sounds like THOSE WE LOVE MOST is an extremely sad novel; and I'm not going to lie, there are parts of this story that are heartbreaking. However, this family's story is ultimately a heartwarming one about the strength and resilience of individuals and families. I absolutely adore how this novel touched upon so many relevant topics about marriage, family, parenting, grief, guilt, forgiveness, and redemption. Needless to say, I think it's positively perfect for book clubs! Overall, I can't help but recommend THOSE WE LOVE MOST to fans of contemporary fiction as well as readers who enjoy stories about dysfunctional families. It's one of my favorite reads of 2012! This does sound sad, but good! It sounds like Maura and Margaret both had unthinkable tragedies in their lives. I agree that it sounds sad and perhaps difficult to read. But between you and Adriana, I may have to give it a try. Off to request this at my library! I often like reading a sad story (as long as it has moments of hope). Terrific review, Julie! I thought I would want to read this, but after your review, I am even more sure that I want to. It definitely sounds like one to get. Maybe for my trip in a few weeks! I'm a passionate businessman devoted to my wife and daughter. This might not be a 'typical guy' book but it's a book I really want to read. On to the TBR list it goes! Great review - I think you covered the novel's strengths so well. Audiobook is out now - for all the reasons you articulate it was (as a mom and wife myself) challenging to read, but I absolutely loved it and was honored to get to record it.